The smell of apple pie baking is comforting and a heartwarming experience of memories for me. Mom made everything from scratch, from the dough to the filling. There is nothing like homemade apple pie! The love she put into her baking was extraordinary and I feel the same when I bake for my family. I reminiscence on all those great baking years with her. Although many years have passed without her, I rekindled many beautiful days using mom's recipe and know she with me watching. 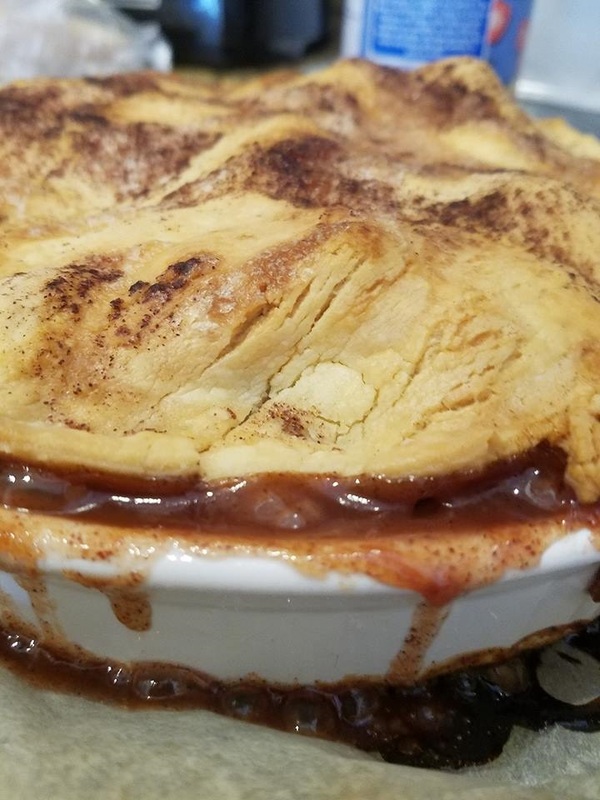 This is one of her best pie recipes, I want to share with you, hope you will enjoy it as much as we do. It's so hard smelling this bake and not wanting to dig right in! 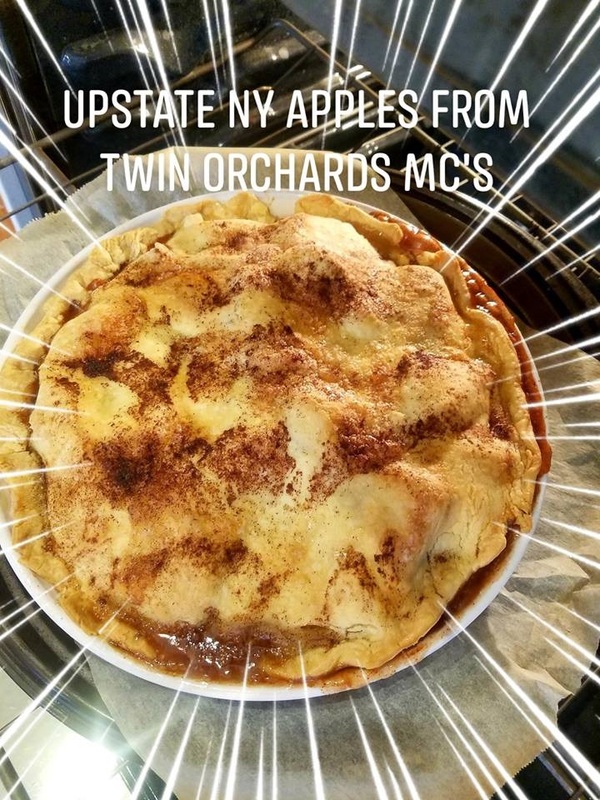 When we go home to visit my hometown (Utica, New York), we always make a special trip to the Orchards to buy our apples. Our favorite kind is McIntosh for making pies. They're a little tart but the perfect baking apple in my opinion but you choose whatever you like! We had trees growing in the backyard of McIntosh apples, a favorite tart apple that made the best pies, but they weren't always kept up every year and needed lots of care. Lucky for us we had an abundance of apples to choose from being from Upstate New York to purchase. 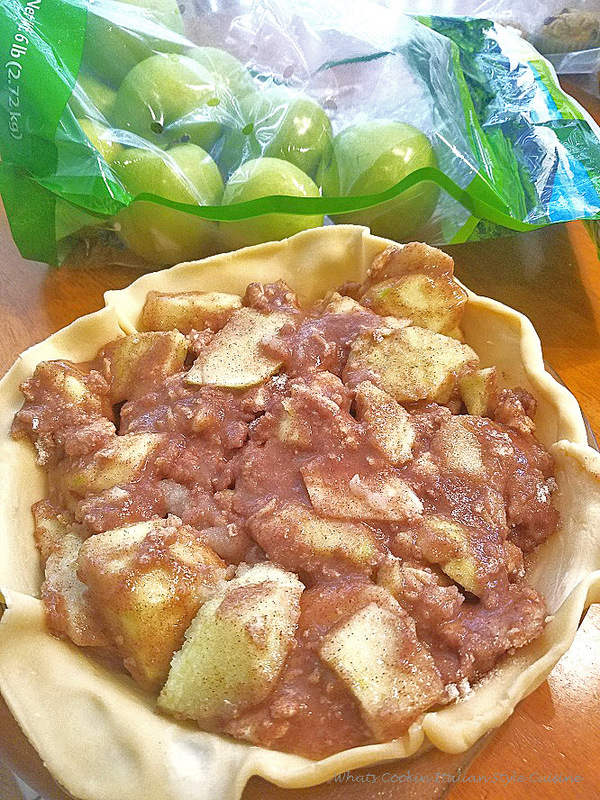 Mom made so many fresh apple recipes, but this pie was a must have every fall during apple season. Just thinking about it makes my mouth water for some. I got such a great deal on granny smith apples, I had to try them. The pie was delicious, a little sweeter, but we all loved it. 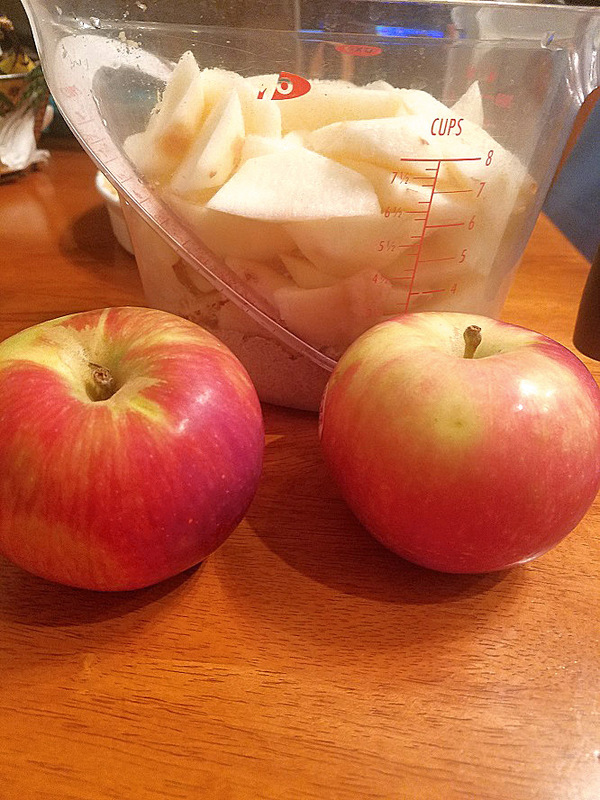 McIntosh will always be my favorite but it doesn't matter, they are a little softer when cooked and also perfect for making applesauce! Bake whatever kind you like! My hometown Utica, New York was notated for great apple orchards. We would buy bushels of them from the Twin Orchards in New Hartford every year. There were so many kinds of apples. When there is a Holiday like Thanksgiving, I love to dress up my apple pie with some leaf cookie cutters. They are easily found on Amazon website or other online baking stores. They really make the pie look so festive! 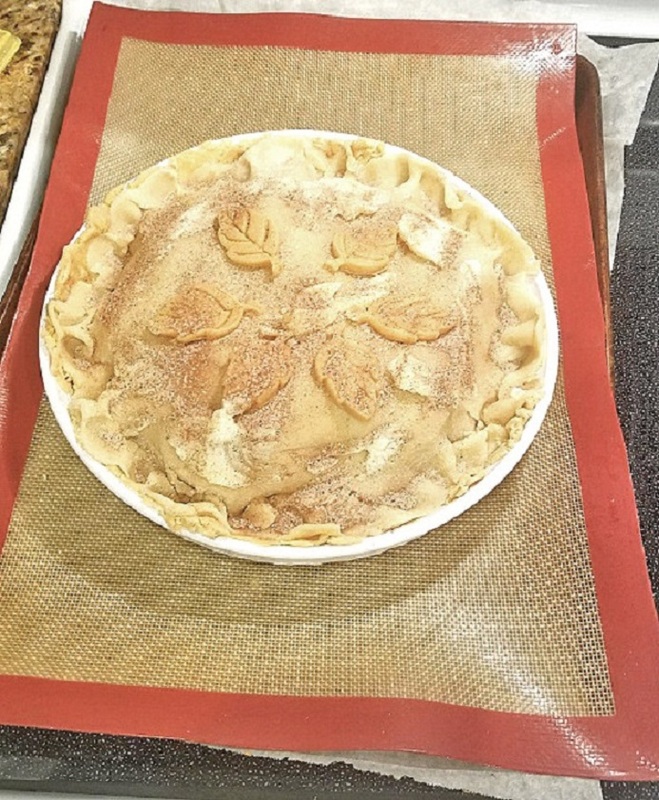 I love this topping on the pie and to make it just a little crunchy on top I add some cinnamon and sugar together and sprinkle it on top before baking. It just browns perfectly and the leaves look so defined. I love the smell of cinnamon baking in the fall. I really don't spend the time crimping the edges like I should, I usually use a fork. The pie is gone so fast, I concentrate more on the top of the pie to look pretty. I love Rome apples, Cortland, Mcintosh and especially the Crispin and Macoun apples. The apples were plentiful and inexpensive, mom would make lots of apple butter and applesauce with the bushels we bought. Mom always made the best crust, then her filling was rich in cinnamon, brown sugar and butter. I hate to say it, but the trees didn't bear as good of fruits, but we occasionally got a good year of fruits. I know pie crust can be a little intimidating, but mom's recipe always came out great. The dough is easy to handle and flaky perfection. We have many orchards there, one we lived near was Twin Orchards and they have every apple imaginable, we love fall for that reason. You can't get any fresher than that! The pies always are the best made with fresh apples. He just couldn't wait for me to make one! I actually won't eat an apple pie unless it's homemade. The apples always are so different fresh that store-bought pies. 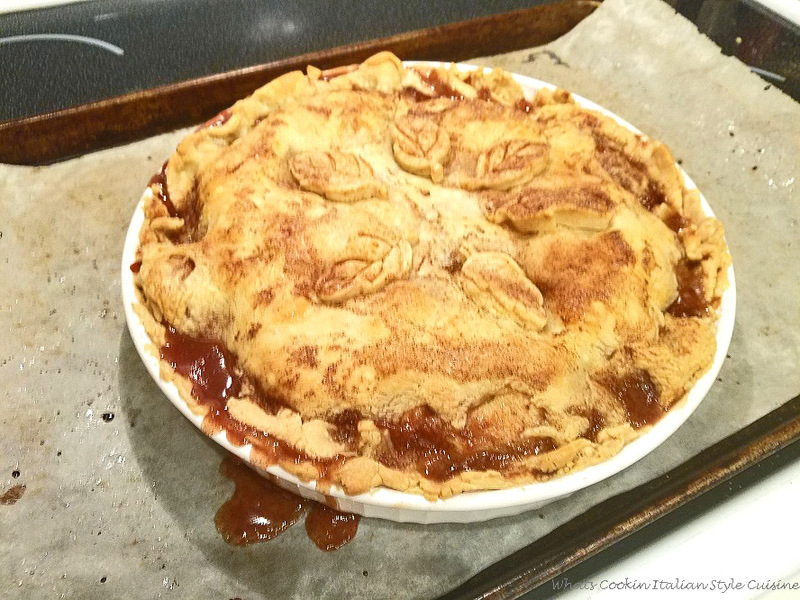 You will never eat store-bought again, once you have homemade apple pie. My son missed the foods we grew up on too. 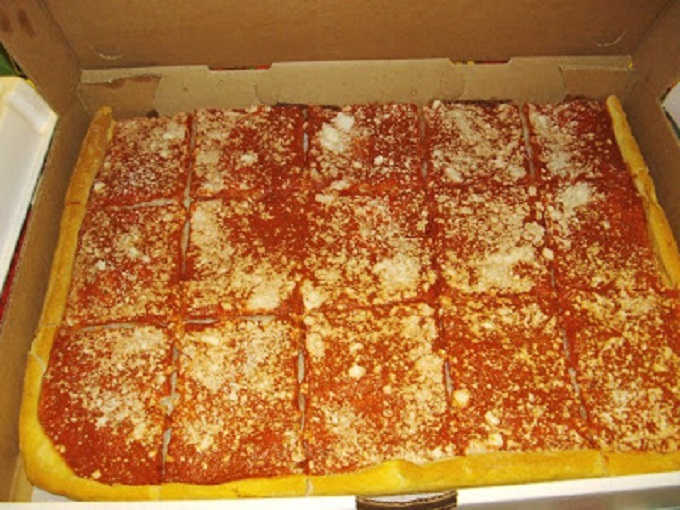 When we moved to Florida no one even heard of some of the foods we loved like tomato pie, turkey joints or hard crusted Italian bakery bread. Chad hadn't been back home in 16 years so he filled up his suitcase with everything and anything he could fit! 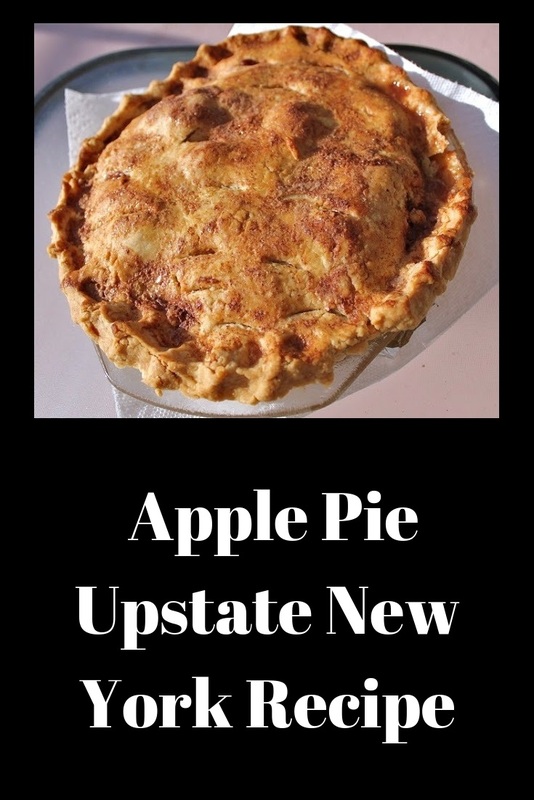 My son Chad brought lots of foods back when he came back from vacationing in Utica NY, he brought me the NY State Apples, some Tomato Pie from Napoli and their bread. I do make my own recipe for tomato pie, but there's always that one you grew up with that brings back awesome memories and that taste isn't duplicated. A crispy coated chocolate and hazelnut candy! Made special right in Rome, New York. These are a delicious candy we love made in Rome N.Y. called Turkey Joints. Another treat he brought back for me we had every year at Christmas. Chad just leave us a taste! It wasn't even cooled off yet and he just dove right in! Not much was left for the rest of us. All I could do is smile, he never even looked up and just kept eating,! Thanks, Chad, I loved everything from our hometown and it made a special Christmas for all of us to have these again. As promised here is the pie he wanted with the apples he brought back. That was a pretty heavy load to carry on the plane in his carry on bag! Happy New Year 2011, we wish you all the best that the new year can bring to you and your family! Now on to making that best ever homemade apple pie recipe below. Brush bottom of crust with 1 tablespoon melted butter. More butter for the top before baking. Peel, core, and slice into thick wedges 8 baking apples. I use Mcintosh! Roll 1/2 the dough out to fit your pie pan ( I lightly spray mine with cooking oil). Pour apple mixture into crust. Roll out remaining dough to fit the top. Garnish dough top with melted or thin slices of butter. Brush dough with 2 tablespoons of milk and sprinkle 1 tablespoon of granulated sugar mixed with 1/2 teaspoon cinnamon on top. Bake at 375 until lightly browned. Cool and slice. Serve with vanilla ice cream or plain. Nice pie (the pizza AND the apple!) Woohoo to 2011! What a great visit! The pie is pure gold, apple pie is ALWAYS the best one to have for dinner. Happy New Year to you and your family, may your dream of more cooking and family play out in 2011. That apple pie looks so delicious and I just imagine it fresh out of the oven and warm... ideal for this time of year! Happy New Year! Your pie looks wonderful...and from that picture of Chad, it must have been delicious!!! Now this pie sounds divine! Have a happy new year dear! The apple pie looks excellent with richly spiced filling! I think apple pie has to be everyones favorite. This one has a beautiful golden color. Apple Pie is always a hit!!! Looks so good and juice!!!Yum! There's not much of anything better than the classic home made apple pie. Thanks for posting! I love apple pie, and yours looks incredible! Apple pie...it's a classic. Looks just lovely. Gosh Claudia! That pie looks amazing. Claudia, I happily buzzed you on this one. Well done my friend. I am wiping the drool off my computer screen as we speak. I just love how your recipes are so homey,simple and delicious! I'm definitely sticking with this apple pie recipe. I love it! Now I have the key to another one of your delicious somethings-this lovely apple pie! I'm so happy that you had such a great visit! Oh man, with that much cinnamon, this is heaven for me! I love, love, love apple pie. 16 years is such a long time! Love the generous amount of cinnamon. Looks like a real winner! Thanks for supporting local food!! I need this pie! It sounds perfect! I love apple pie too, but I usually make apple crumble. I never have the confidence to make a pie, but I am going to follow your instructions and give it a go. I love apple pie, it is one of my favorites! Yours looks amazing! The crust color is so perfect! Apple Pie is such a great classic! I love that your son brought you a batch of NY apples to enjoy. It looks like he reaped some of the rewards from it too! I love apple pie season! And homemade is always the best! Love this classic apple pie recipe! And you're so right, there's nothing quite like grandma's apple pie! 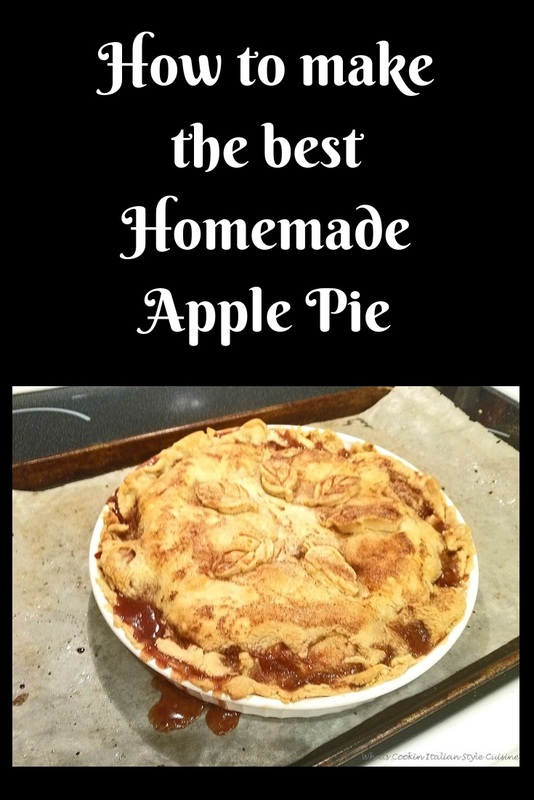 This is the best homemade apple pie recipes I've seen yet! Thanks for sharing! Such an amazing dessert classic! I love how fantastic the smells when it's baking, such a wonderful bonus! I used your recipe to teach my grand nephew pie making. It was a delicious success! He was the star of the evening. I will make this pie again. I love how homey and comforting this pie is. Definitely something I would serve for the holidays. That pie looks amazing! I love the big pieces of apple and that delicious blend of sugar and spices. This looks perfect for a holiday table. You're right, apple pie baking in the oven smells wonderful. And using apples right from an orchard makes that pie extra good. I understand the desire to stock up on all the goodies you miss then take them back to your southern home. Nothing beats homemade pie anytime of the year, especially during the holidays!Looks so quick and easy! Wow, nothing like homemade apple pie and you nailed this one! Thanks for sharing this fabulous recipe. Gonna send to my sis who is the baker in the family. 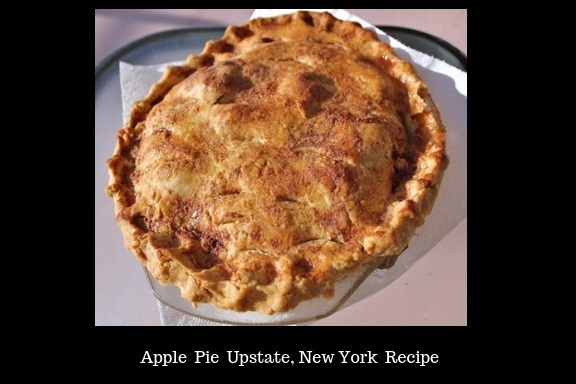 I love apples since i was a child and no wonder why my favorite pie is an apple pie! What a great flavor! I can't believe I've never made an apple pie. Apple pie is delicious and I love the leaf decorations on top! I tried this recipe for the first time today. It was the easiest way to make a delicious apple pie. I will never have to buy a apple pie again. I will continue using this recipe. Thank you so much for sharing it. You just cannot beat an apple pie at this time of year; it is one of our favourite family desserts. It doesn't get more classic than homemade apple pie! So many different variations when using different types of apples too.